Reserve A Mountain Lodge Today! The cabin is very nice! The rooms are spacious and comfortable. The kitchen is really big and so is the dinner table. We were able to go from preparing food and hanging out at the large island in the kitchen to eating dinner together at the table and we were never pressed for space. The cabin is close to the main road in a convenient location. My only complaint is the state of the couches downstairs- not a pretty sight. We enjoyed our stay even with some issues in our cabin. The refrigerator constantly leaked water and the dishwasher would not get the dishes clean. We had a bedroom that someone before us had broken the chain on the ceiling fan, so you couldn't change the speed and a drain in the master bath that someone had broken the sink stopper, but a call got that corrected. We were all older couples and up and down the stairs were a bit of a choir but we made it work. In the future you may want to qualify customers to if they have special needs, ( wheelchairs, etc. ) We had a great time while in Pigeon Forge and will I'm sure use Cabins USA again. We stayed at A Mountain Lodge for 3 days, 2 nights. I have visited Gatlinburg and Pigeon Forge multiple times and have always stayed in cabins that were in more secluded areas. I absolutely LOVED the location of this cabin. We didn't have to drive too far up steep heels and winding roads, and we were minutes from town and all the attractions. The cabin was nice and comfortable. I read many reviews before making this cabin selection and read the reviews regarding the furniture on the first level. The couch on the lower level is a leather (or maybe faux leather) and it is peeling. I read one review where someone said the pieces of couch were stuck to them...I did not have this problem. This was not an issue for me, as we didn't spend much time on the lower level, and when we were, we were playing pool. Although the televisions in the rooms were small, I was happy there were even there because it was not clear in the description. Overall, I loved this cabin and will definitely continue to use Cabins USA as my preferred vendor. The cabin is spacious and the 6 people staying had a lot of room. We chose such a large cabin because the price wasn’t very different from other companies with three bedrooms. The cabin was clean, the hot tub was ready when we arrived, and the pool table was a nice addition. Every room had a tv with satellite. Everything was great except the comfort of the mattresses. Those could defiantly use an update. The location was nice and easy to find. We only had to bag the trash, load dish washer, and place dirty towels in the floor when we left. We sent a text to check out. I would rent this cabin again! The cabin was overall nice and so was the pool access. However the floors were very dirty and the couch downstairs was coming apart so that when you would sit on it the material would come off on you. The cabin was supposed to hold 15 people but there were only seats for 11 at the table. Was a very nice Cabin will use again in future. This was our 2nd time booking with CabinsUSA and we have been very pleased each time. The cabins were clean and amenities were there for everything we needed. I especially like the check in/check out process where everything can be done from my phone/computer and it makes it so much easier. This last cabin was a 5 bedroom cabin and we had plenty of space for 5 families and the kids all loved it. It was also very cheap as I booked with a buy 2 nights, get one free and splitting it between 5 families made it cheaper than getting a motel room for one night! I will definitely be booking with CabinsUSA again in the future. The stay was good overall. We only stayed 2 nights and some ran out of toilet paper, and paper towels, and we ALL ran out of towels. So we had to to laundry after the first night and reuse our towels as we are all waiting for clean towels to shower. Each rest room had 1 roll of toilet paper and there was 1 roll of half used paper towels in the kitchen to use. There was no dish soap so good luck washing dishes. There was glass in the hot tub which my brother got stuck in his foot, there was a ear ring jammed in the microwave door where it wouldn't shut all the way. Also there is not salt and pepper so bring what you need. After all of that it was good. We all loved the cabin and we definitely will come back. The only issue we had was with the washer and dryer, neither fully did it’s job. Other than that the entire cabin and location was great. The cabin was nice. The only drawback is not having any blinds on the main floor. There is no privacy for you or for the people staying in the cabin across the driveway. The cabin was very nice but couches could use updating. One is peeling so bad that it comes off when you sit on it. We enjoyed our time at the cabin and it was close to everything we wanted to do. Floors were dirty. Not enough garbage bags. Asked for more propain gas and never got it. Dust bunnies everywhere. Looked like they never cleaned under the beds for months. Other than that we made the best of it. 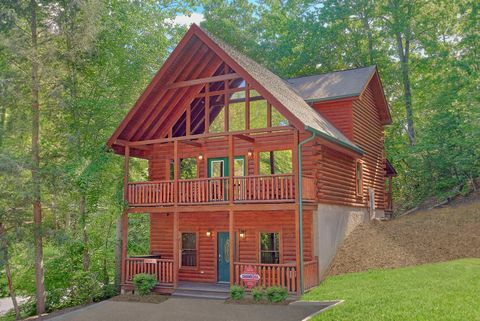 Booked this cabin for a couples retreat. The location was awesome. There are a few things that could have been better. The couches in the living room are extremely worn. The leather is all peeling off the couchs which makes the living room look pretty bad. The kitchen was well stocked with all the dishes that we needed. One negative is that the only way to get to the hot tub is through the master bedroom. The kitchen being on the second floor was not a problem as I originally thought. Overall I love Cabins USA and will be booking our retreat for next year with them! The refrigerator has a leak in the back right corner inside which creates ice on the shelf. Otherwise, we loved the property! Nice! Thank you for taking the time to let us know about your recent stay in A Mountain Lodge! We here at Cabins USA work hard to make sure each of our guests have the best stay possible while vacationing in the Smokies. Thank you for letting us know about the refrigerator. Your comment has been forwarded to our maintenance department to be addressed. When you are ready to stay with us again, please mention you are a return guest for an additional discount. Thank you for choosing Cabins USA and we look forward to seeing you again soon! The cabin was filled with 10 people yet we only had 6 forks so that was a challenge. Some of the kitchen equipment didn't work; ie the electric beater only one beater worked, one of the measuring cups leaked; the spare coffee put in cabinet the carafe was too big so we couldn't use that which would have been nice with so many coffee drinkers. Those are very minor and only mild inconveniences but for some more picky people could be reason for crabbiness. Our kitchen faucet broke and they were prompt and courteous in their repairs. Maybe a few extra blankets . we could only find one extra blanket; but again. Nothing catastrophic. we loved our time there. OH yeah it would be helpful for those not from the area to have a book of the attractions. Other homes that I have rented have had like "courtesy books" that have flyers from the local attractions. We had to make an early morning run to grab pamphlets so we could plan our events. And maybe a sign in book is fun also that I have seen in other places; just something to "register " and leave a fun little note about our wonderful wonderful time there. it was an excellent experience. thank you. best Christmas in a long time. This cabin fulfilled all that was needed! I am so happy to hear that you enjoyed your stay in A Mountain Lodge! When you are ready to stay with us again, please mention you are a return guest for an additional discount. Thank you again for your review and thank you for choosing Cabins USA! Previously we stayed in a cabin that had the main level on the ground floor and liked it much better than all the steps in this one. We found the cabin to be clean and comfortable. The only complaints we had was that the sofa and love seat on the main floor were so badly worn, no one wanted to sit on them, so we had to cover them with extra sheets that were provided, that were not required for sleeping purposes. Also, the ice maker in the refrigerator did not operate, so we did not have any ice for drinks etc and had to buy a bag. We certainly consider using this facility again next year for our reunion. Best we have found yet. Thanks so much. The cabin was really nice, but the living room furniture was very ugly and worn out that we had to cover it with a sheet to sit on it, the kitchen sink linking but was fixed, the upstairs tub was so filled with hair that they was draining slow, and the irons were broken, but you all did replace two of them. It would be nice if you'll gave your guess 2 face towels instead of 1 some people such as myself and everyone in my cabin don't wash their face with the same rag we use for our body so you should supply more, and when you are having that many people staying in a big cabin I think that someone should come and check on the trash daily for pickup instead of guess having to call so it can be picked up. I was disappointed in the property. The upper windows were filthy, the floors were not mopped there was sticky stuff with dirt on it in some areas, the grill was so nasty and greasy that it no longer lights in some areas and continues to burn due to the grease built up, the couches in the upper living room are pealing, ran down and nasty. The faust in the kitchen is broken and the hot water is slow. I call to report issue with faust and scrathes on the floor. I had to call for a tank for the grill, my interactions with the staff (Jeff) was pleasant and he was prompt. The beds were very comfortable and clean! It was inconvenient because of having to carry everything up the stairs to the kitchen. We realize that has to be when you have a 3level cabin and entering in on the lower floor. It is because we had friends that had knee problems. You need steps at the hot tub. Thank you. Thank you for taking the time to let us know about your recent stay in A Mountain Lodge. Our cleaners work hard to make sure each of our cabins are thoroughly cleaned and fully stocked so all our guests have to do is walk into their cabin and start relaxing. I apologize for the inconvenience of the lack of steps to the hot tub. Maintenance has been notified and will be addressing that issue. When you are ready to stay with us again, please mention you are a return guest for an additional discount. Thank you again for your review and thank you for choosing Cabins USA. The cabin was beautiful and the location was very easy to access. We had 4 families that stayed here and we had plenty of room for everyone. The beds and pillows were extremely comfortable. The freezer wasn't getting cold enough and we had to call the office. They sent someone out to look at it quickly. There were a few house keeping issues, but we just made the best of it and enjoyed our stay. The leather on the couches were peeling off, so you had to have someone brush you off before leaving the house. The floors were all very dirty. I'm sure it has been a very long time since they've seen a mop. One family found a hair in their bed and another family found a hair in their shower. There were dead bug in the window sills downstairs. All-in-all, we had a great time and really enjoyed our stay. The cabin was very nice and there was plenty of room for everyone in our group. The only complaints we had was the carpet in the cabin and on the steps were soiled and dirty. There needs to be more lighting in the kitchen area where I felt it was very dim for cooking. The furniture in the upstairs living area was very worn and dated and there also was suppose to be a fooseball table that was listed on the booking details that was not there when we arrived. It would have been nice to have a wall mounted hair dryer in the bathroom since I did not bring mine with me because they are available in the units we usually stay in. We enjoyed our stay in the Smoky Mountains and would recommend Cabins USA. Thank you for taking the time to let us know about your recent stay in A Mountain Lodge. We here at Cabins USA work hard to make sure each of our guests have a great stay you enjoyed while vacationing in the Smokies. Thank you for letting us know about the carpet and furniture in the cabin. Your comments have been forwarded to our Owner Liaisons who will be speaking with the owner of the cabin in regards to having those issues corrected. When you are ready to stay with us again, please mention you are a return guest for an additional discount. Thank you again for your review and thank you for choosing Cabins USA! Everything was awesome and fit our needs perfectly. The only issue was there was a strong rotting fish smell on the second floor that we could not find a source for and made it difficult to hang out on that floor. Thank you for taking the time to let us know about your recent stay in A Mountain Lodge! We here at Cabins USA work hard to make sure each of our guests have the same great stay you enjoyed while vacationing in the Smokies. I apologize for the issues you experienced with the smell on the second floor. Maintenance has been notified and will be correcting that issue. When you are ready to stay with us again, please mention you are a return guest for an additional discount. Thank you again for your review and thank you for choosing Cabins USA! This cabin was very nice and plenty of room for my family. Everything was clean except for the carpeted stairs. They were stained. I realize this is a high traffic area. It was the only negative in the cabin. It is close to everything, just a short drive. I would stay here again. I am so happy to hear that you enjoyed your stay in A Mountain Lodge! We here at Cabins USA work hard to make sure that each of our guests have the same great stay you enjoyed while vacationing in the Smokies. Thank you for letting us know about the carpet on the stairs. That has been forwarded to our Owner Liaisons and they will be speaking with the owner of the cabin to get that issue resolved. Thank you again for your review and thank you for choosing Cabins USA! The "A Mountain Lodge" cabin worked out perfect for our family vacation. The king size beds and each bedroom having a bathroom was ideal for us with the grandkids. It was a great cabin and the location was perfect by being less than 5 minutes from the parkway. We had plenty of parking for our 3 vehicles too. The only thing was you could tell that the carpets had been swept, but they really need a professional cleaning to get the stains etc. out of them. Also, the second floor level really needs curtains or blinds on the front windows. The wide open glass lines up directly to the cabin across from it and we could see them very clearly at night and I'm sure they were seeing us too. Overall, the cabin was great and made our stay very comfortable. Last year, we stayed at another companies cabin and I must say that I will definitely use Cabins USA again. The staff was kind and very professional and the express check in and check out is brilliant. We picked out the cabin online and then booked it online and did the express check in and check out and never had to stop at the office or deal with anyone face to face, so it didn't take any time out of our vacation. I would definitely try to get "A Mountain Lodge" again on our next family getaway to the Smokies. Very pleased!! Thank you so much for all of your kind words! We work hard to make sure that each of our guests have the same great experience you enjoyed while vacationing in the Smokies. Thank you for your suggestions of the blinds. We are always looking for ways to improve our guests' stay. When you are ready to stay with us again, please mention you are a return guest for an additional discount. Thank you again for your review and we look forward to having you as our guest again! The cabin was in a good location. The cabin carpets were filthy. It needs to have laminate or some other type of flooring. With the amount of traffic it has it needs a different type of flooring in the bedroom and the downstairs entrance. Plenty of dishes but no spatulas, needs a big frying pan and a light fixture over the cooking area. While we were there, the upstairs shower drain had a leak and water run down onto the light fixture in the master bedroom (this was the last shower taken before heading home). It needs a good dusting especially the walls. We would probably use CabinsUSA as a booking agent but not this cabin. Too many stairs for us older folks. CabinsUSA could not answers particularly questions about this cabin. I know you have over 500 hundreds properties you rent but you should have a sheet on each one so that any particular questions could be answered. Also it rained while we were there and the back porch leaked (about center of the porch) before it rotes the porch. The carpet going up the steps to the kitchen area was very, very dirty. It didn't even look like it had been vacuumed. It probably needs replacing. The fitted sheet on my bed was so old and worn out that it kept coming off the mattress. Otherwise things were fine. Everything seemed to work. The office staff is always fantastic. I really liked the online check in. There were a couple of this not working such as two ceiling fans and a vanity door off. We called and they come out and checked them left a note and said they would be back to fix them and they never got fixed while we were there. They cabin had lots of space and was nice. We enjoyed our stay! Thank you for your review. I apologize that everything was not in working order. We have insured that maintenance has fixed the issues you reported. We are glad that you enjoyed your stay with us here in the Great Smoky Mountains. I loved the cabin. The Wifi did not work the entire week. The only other negative thing I could say is that the cookware was not the best, we had 14 people and only 7 forks to eat with, and we tried to save money by cooking and only 2 burners on the stove worked. We still had a good time sand enjoyed the trip. For the most part the cabin was lovely. It was my first annual couples retreat. A total of 5 couples. Cabin was beautiful. It had everything that we needed. However, we did run into some minor issues. The first night the kitchen sink was leaking very bad. We called the front office and they sent someone to fix it the next morning but by the end of the next day it was back to leaking again. I didn't want to be a pest so I didn't keep calling back for the repair. The bath tub on the first floor was backed up and the last night the handle on the stove broke. Overall great cabin it was clean and we all enjoyed ourselves. Thank you for taking the time to review your couples retreat with us. We are delighted that you enjoyed you stay with us at A Mountain Lodge. We appreciate all your feedback and apologize for any inconvenience. We have addressed the issue with the leak and replaced the stove handles. Again, we appreciate your business with us, and we hope that we will see you again very soon. Do not forget to call and ask about our return guest discount. We loved the cabin! Didn't like the location of the hot tub. I have stayed at Gatlinburg Falls and each of their cabins has more games in their cabins. Carpet really needs to be updated. We wore our shoes the entire time due to how dirty they were. Overall, I would love to come back and stay at this cabin. We are already planning out next trip there. This was one of two cabin that I booked, the older couples stayed in this cabin, there was a few problems, with the water leaking from the A/C unit & tv's we're not working but we called & the repair guy & he came out fixed everything & even recommend places for us to eat:) everyone in this cabin enjoyed themselves!!! Let me tell you trying to please the older couples was my biggest issue & for them to love it & want to go back says a lot!!!! So I will def make sure that happens:) check in & check out was a breeze. Thank you for taking the time to write your review. We are delighted you and your family enjoyed your stay with us at A Mountain Lodge. We apologize for the issues you experienced at the beginning of your stay. We are happy that our maintenance team was able to respond in a timely and professional manner. We look forward to seeing you again soon. Do not forget about our return guest discount. Cabin USA staffs meet all my expectations. Check in quickly, staffs are nice...The cabin is perfect for all of us, except the way go to the hot tub on the back. We have to go through master bedroom, it's not convenient for people who sleep in there. The carpet needs replacing. Other than that, it's perfect. We will be back next time. Thank you for you review. We are delighted that we met all your expectations for your stay with us. We apologize if the location of the hot tub is inconvenient. Please feel free to call us in the future and allow us to help you with booking the perfect cabin for you. Hope to hear from you soon. Thank you for your review Sarah. We appreciate all your feedback on your stay with us. We will have the inspector look into the issues you have addressed. We are delighted that you liked A Mountain Lodge, and hope to hear from you again soon. Everything about the reservation process was quick and easy. The cabin itself was very clean & located in a great spot, not far at all from shopping, restaurants, etc. This is the second time I had booked with Cabins USA. My only complaint was that in the downstairs bedrooms, both mattresses need to be replaced. There were "indentions" in the mattresses in both sides that made it uncomfortable to sleep on. Other than that the stay was very pleasant. Thank you for your review Emily. We are happy that you had a great time staying in the Smokies at A Mountain Lodge. We apologize if the beds inconvenienced you in any way. We have had the bed fixed. We hope that we will hear from you again soon. We loved the cabin. All beds were comfortable. Loved the proximity to town! The only thing that should be different is the door to the hot tub was only available through a bedroom. It should have exited from the kitchen. Not enough dish towels and dish cloths were made available. We had to purchase additional ones. We loved our stay. So thankful we were able to find this one at the last minute! I liked that it was far enough off the main road but close enough to everything.. Really enjoyed myself.. The only thing was, to get to the hot tub, we had to go thru the bedroom, instead of the kitchen or livingroom.. but other that that, it was fine. Overall good experience. sometimes the arcade game that is in the room upstairs (pacman) doesnt' work. Thank you for your recent stay in A Mountain Lodge. We are so glad that you enjoyed your stay with us and hope to have you back soon on a future stay. We do appreciate the suggestion about the carpets. We will have them cleaned ASAP. Thank you again for your business and we look forward to hearing back from you soon. The carpet needs to be replaced bad. The porch was real dirty and cigarettes butts all over the parking area. Our stay in the Mountain Lodge was very nice. The cabin was very clean. The only problem we had was that there were no blankets for the beds and it was a little cool at night. But we made it fine. We will definitly stay with Cabins USA again, The staff is great and very helpful. I have stayed at alot of cabins in Pigeon Forge and Gatlinburg over the last 15 years. I have a few times booked with someone other than Cabins USA and never have been satisfied with them. I will only book with Cabins USA from now on. Have stayed at this cabin 3 years in a row and enjoyed it. Only drawback is that the second floor has no privacy. The wall facing the cabin across the drive has wide open windows and there are no blinds in them. The cabin was in a good location but wide open windows with no shades looking directly into your neighbor's cabin in front of you. The carpet was very, very dirty and the extra blankets were dirty. The cabin was nice but could use a professional carpet cleaning. Overall I love using you guys when we visit Pigeon Forge and the staff is always very helpful. This time the hot tub didn't work at first, the cabin was not really clean either and that was a first and pretty dissappointing. I found socks in the pull outs and there was items on the floor. I had bragged on how much I love using you guys and then when the cabin was not clean and the hot tub didnt work and the refrigerator was leaking like crazy, I was a little embarrassed that I had bragged so much! Cabin was in a good location. Could have used a good cleaning. Carpet was nasty, window cracked, cobwebs on windows. Overall though good value. Always love Cabins USA but was a little disappointed this time. Thank you for choosing Cabins USA. We are glad you enjoyed your stay at A Mountain Lodge. We apologize for the inconveniences you encountered. We hope that you will give as another chance when planning your next visit to the Smoky Mountains.